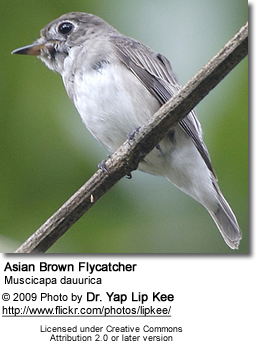 The Asian Brown Flycatcher, Muscicapa dauurica, is a small passerine bird in the flycatcher family Muscicapidae. It includes the Brown-streaked Flycatcher, which is sometimes considered a distinct species Muscicapa williamsoni. This is an insectivorous species which breeds in Japan, eastern Siberia and the Himalayas. It is migratory and winters in tropical southern Asia from southern India and Sri Lanka east to Indonesia. 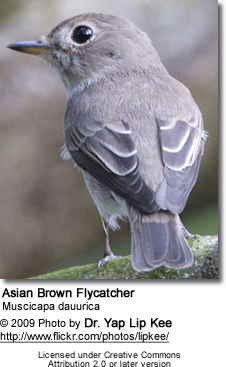 Asian Brown Flycatcher is an extremely rare vagrant to Western Europe. Records have come from Britain, Denmark, and Sweden, and in addition, there are unproven claims from Ireland, Faeroe, and Norway. On 3 October 2007 a first winter Brown Flycatcher was discovered at Flamborough Head, East Yorkshire which attracted hundreds of birdwatchers during its stay which lasted until dusk of the following day. This looks set to become the first accepted record. A previous record, on Fair Isle, on 1-2 July 1992  was regarded by the BOURC as not definitely of wild origin. A bird had also been claimed on Holy Island, Northumberland on 9 Sept 1956, but the identification was not accepted with beyond doubt. This species is 13 cm long, including the cocked tail. 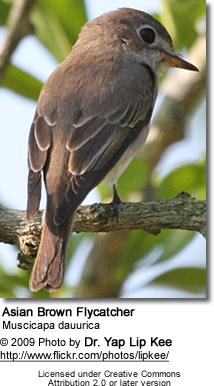 It is similar in shape to the larger Spotted Flycatcher, but is relatively longer-tailed. The dark bill is relatively large and broad-based. The adult has grey-brown upperparts, which become greyer as the plumage ages, and whitish underparts with brown-tinged flanks. Young birds have scaly brown upperparts, head and breast. Although usually treated as monotypic if the Brown-streaked Flycatcher is not included, Rasmussen and Anderton, in Birds of South Asia. The Ripley Guide argue that populations in the Indian subcontinent and the Andaman Islands should be regarded as a separate subspecies, poonensis, from the nominate race which occupies most of the species' range. They describe poonensis as paler and browner above, with a deeper bill, and mostly pale lower mandible, a more mottled throat, breast and flanks (in fresh plumage), less contrastingly white "spectacles" and throat, and perhaps a more rounded wing. 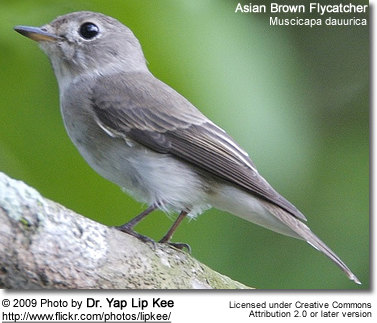 Asian Brown Flycatcher is a common bird found in open woodland and cultivated areas. It nests in a hole in a tree, laying four eggs which are incubated by the female. The male Asian Brown Flycatcher sings a simple melodic song during courtship. This bird is parasitised by the chewing louse Philopterus davuricae.